IMPORTANT - Restrictions on use Ask at Low Deep Slack on every occasion. Hang gliders only. Max number of six. May be restricted during lambing period. An excellent site, quite shallow but it works well. At the moment it is hang glider only and rather restricted in terms of numbers. One of the few true southerlies in the district. Good top landing but growth in the number of masts may restrict things a little. Tarnside. This building lies about 100m east of the turn off for the track up Whinfell. A685 north from Kendal to Grayrigg. Turn left at Church and follow a minor road for 2.8km to Low Deep Slack (farm on right across a field - ask permission). Contiunue along road for further 800m to a gate on the right. This is the start of the track. Drive the tarred fell road to masts ....no walking required. (On occasions the gate may be locked .... check at Low Deep Slack). No paragliding at present. The take off area is quite shallow and has a power line running through the face of the hill. 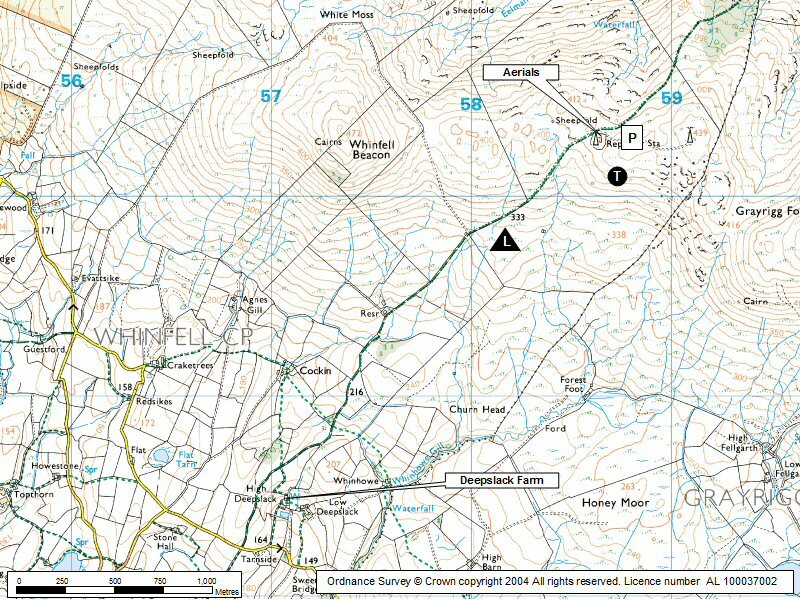 Whinfell Beacon itself is a no go area for take off but can be overflown but not scratched! Excellent. A very effective site with a tarred road to the top. The site can be affected by sea breeze.